Use the safety glove and the sponge to apply the cream in a thick layer. *Wait at least 5 minutes before removing the cream. Do not leave on longer than 7 minutes (and no longer than 2-3 minutes, if applied to arms, underarms or bikini line). Wipe with the sponge until all hair has been removed, and rinse the skin thoroughly. The synergistic effect of all components of FreshDepil makes it suitable for all types of body hair. This seed oil is full of antioxidants and vitamins, which make it an impressive moisturizer, well-known for its nourishing and restorative properties. Lavender Oil is a natural ingredient that is generally used to detoxify, cleanse and soothe the skin. Glycerin acts as a very effective moisturizer on the skin. It has a smoothing effect and maintains the skin's water balance on an intercellular level. FreshDepil's packaging is designed to fit in with your daily routine – just turn the pump of the bottle to unlock it and you're ready to start. 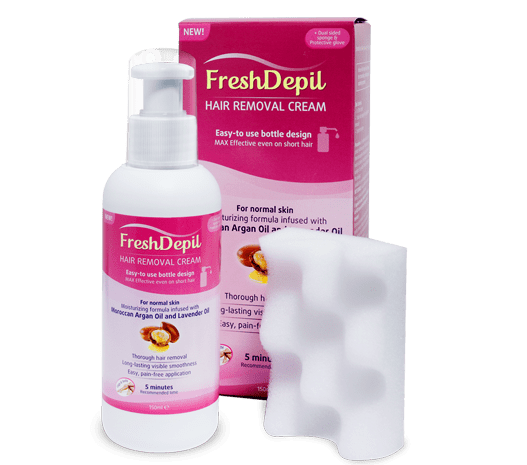 FreshDepil's painless formula works even on coarse and short hair. Results are visible within 5 minutes. FreshDepil's price makes it the more affordable choice in comparison to expensive hair removal procedures. FreshDepil LLC shall not be liable for any loss or damage of whatever nature (direct, indirect, consequential or other) which may arise as a result, directly or indirectly, from the use of any of the information, services, links or material contained on this website or from an inability to use this website, with no regard to the circumstances upon their occurrence. Such exclusions of liability apply only to the extent permitted by law. 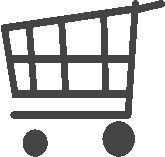 Should any provision of these Terms and Conditions become invalid, this shall not affect the validity of the remaining provisions.